Elementary Field Day - Anyone who has had the opportunity to assist or participate in RMAE's field day, knows that this isn't your run of the mill field day! Lisa Best, our P/E instructor, works very hard to design and organize fun, unique and sometimes very challenging field day events. A huge shout out to Mrs. Best for another fantastic field day. And another huge shout out to all the parent volunteers who are crucial to the the day's success! Mrs. Vickery joins in on the Hippity Hop race! The four legged race takes lots of teamwork! 1st Grade - Math Games - The first graders had a good time playing a math game called Doubles Bump on pajama day. 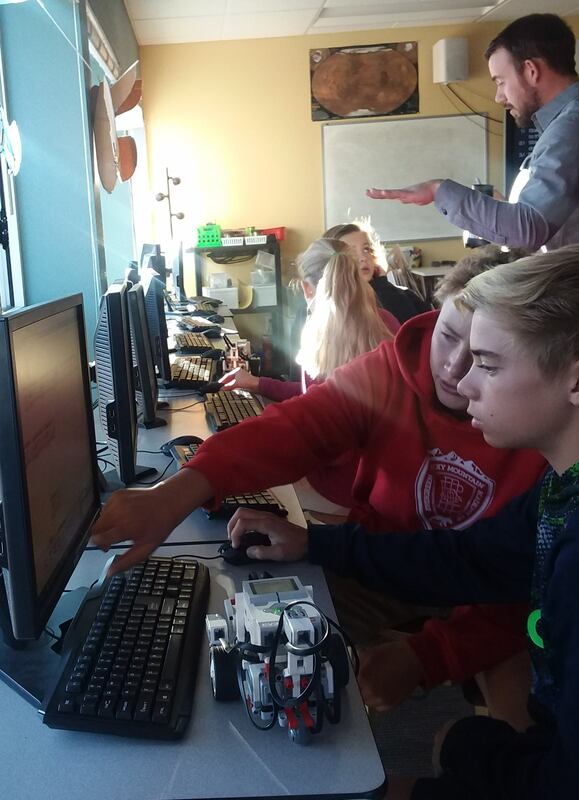 Technology - Robotics - Students were given a list of challenges used to program their robots. 1) Start on the western blue line, drive through the wooden stool to the second blue line and lower the claw. 2) Start on the western blue line, drive through the wooden stool, drive through both blue squares and capture the cube. 3) Start on the western blue line, drive through the wooden stool, drive through both blue squares from the west, capture the cube and move it into the blue/white square from the east side.